I keep telling her, it will be Spring when all the snow on the ground will have melted and we can see green grass again. Today is the first day of Spring, the Spring Equinox in the Northern Hemisphere. Despite my best predictions there are still piles of dirty snow on the ground. Oh well, I never was much of a meteorologist! I digress. 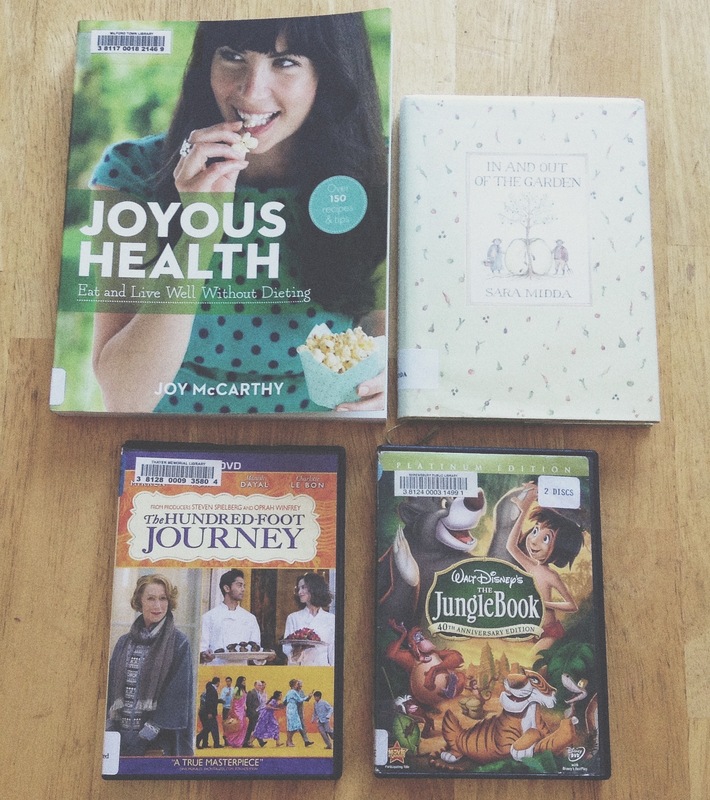 Back to the library haul. I have two non-fiction books for you. ‘Joyous Health’ by Joy McCarthy was indeed a joyous read. Rather than being yet another book about a new fangled way to lose weight via a restrictive diet it is a guide with tips to improve digestion, increase energy, balance hormones, improve sleep and just overall improve one’s health. I did not go in great detail over the 150 recipes that the book offers but they all seem quite straightforward. I especially liked the chapters named ‘Get Your Gut on Track’ and ‘Superfoods and Healthy Lifestyle Habits for Joyous Health’. 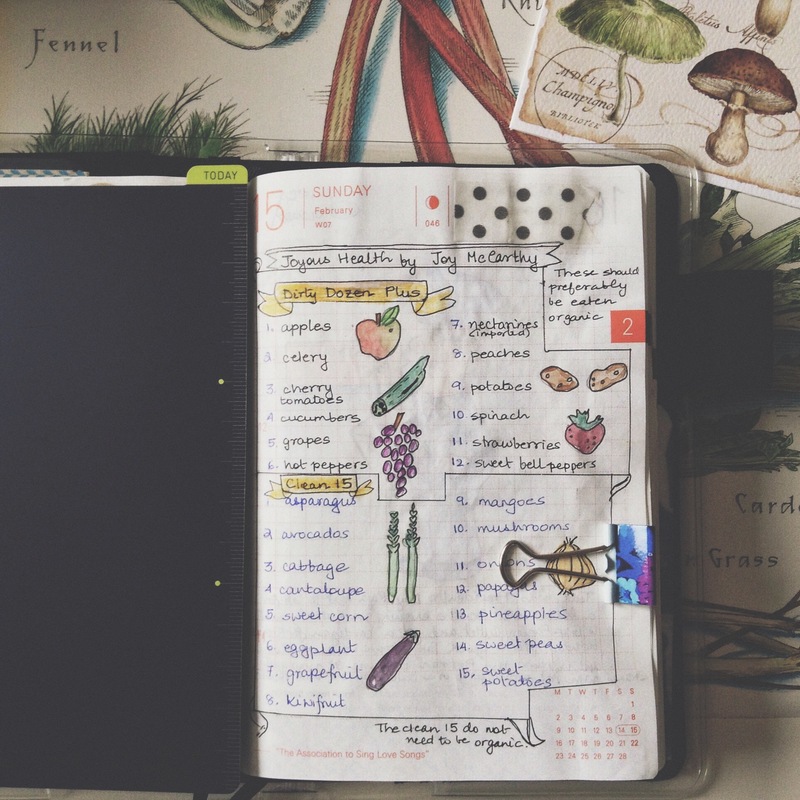 I made illustrative journaling notes of some of the ‘Clean 15’ fruits and vegetables that do not accumulate significant levels of pesticides. I may have to purchase a copy of the book to keep for future journaling inspiration. It is a beautiful book to admire and browse. I had wanted to see ‘The Hundred Foot Journey’ ever since it hit the cinemas last year. I am glad I didn’t. Overall it was an entertaining if somewhat improbable look at an immigrant Indian family’s attempt to set up an Indian restaurant in France. Some of the points covered were the differences between Indian and French cuisine and a talented Indian chef’s attempt to merge the two cuisines with his cooking. Although I am Indian myself, the story just did not resonate with me. I have not read the book so maybe I am missing something when I watch the movie. On the plus side some of the scenes of rural France are just breathtaking. Three out of five stars for me. Lastly we have that inimitable Disney classic ‘The Jungle Book’. I watched this movie when I was a child so it was nice to re-watch it with little M. She seemed to enjoy all the songs although she was a little afraid of the wild animals at first. After a while she made good friends with them. She asked to watch this again- high praise indeed from a three year old. So till next week when I will have a fresh library haul for you- goodbye. P.S. My attempts to illustrate and document the ‘Clean 15’ and ‘Dirty Dozen Plus’ fruits and vegetables below. Never remember you being such a good illustrator. Nice article and loving your blog. Hundred Foot Journey- loved Om Puri in this and the cinematography. Haha. You laughed away my idea of painting my own banner 😉 Om Puri and Helen Mirren – great casting. Hard to imagine them boyfriend and girlfriend though. Gorgeous cinematography… and those market scenes of rural France!